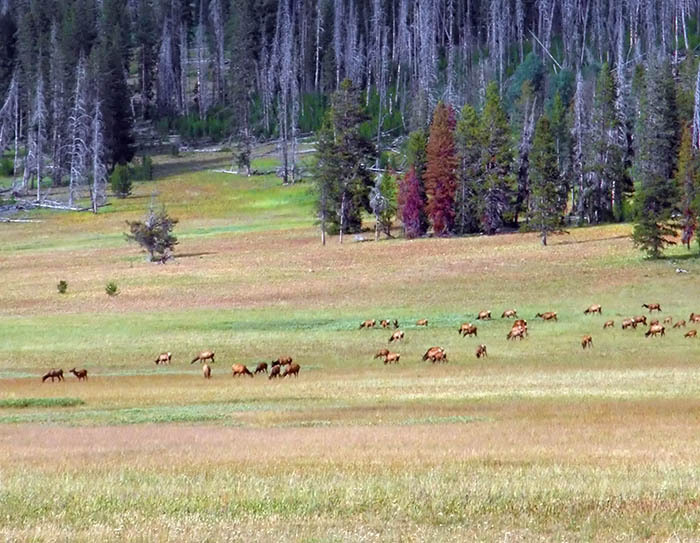 A small part of a herd of 300 or so elk on Ayers Meadow in the Frank Church Wilderness in July, Central Idaho. This has always been great elk country, but several years ago cattle grazing in the drainage was bought out, so now these public lands have more elk than ever. Idaho –mule and white-tailed deer, moose, elk, bighorn sheep, mountain goats, lynx, wolverine, pronghorn antetope, wolves, cougar , bobcats, black and grizzly bears, and a state where the public owns more than 60% of the land. Don’t let the privatizers, the political dividers, or the industrial interests ever take it away from you. Grizzly bears in central Idaho’s Frank Church wilderness? Curious, has this been confirmed? Brings back memories of four great days spent at the Fir Creek Campground near Bruce Meadows in June 2004. We watched 150-or-so head feeding behind the airstrip and even thought for a moment we were watching a wolf (which turned out to be a sandhill crane). But what about the beetles? Who is going to protect us from the beetles? Are you serious? Perhaps. If not, good joke! The dead trees in the background were perfectly green and died in a forest fire in 1988.